This is the story of Peter Wing, son of a landless Cantonese peasant, and first Chinese Mayor in North America. From the arrival in Kamloops of Eng Wing Him, his father, to Peter's accomplishments in his retirement, it covers the history of his life and the growth of city of Kamloops. Peter Wing's father Eng Wing came to Canada in 1910 at age 16 fronm the Canton region of China. He returned to China in 1910 to take a wife before returning to Canada in 1913. Peter's mother was the only fifth Chinese woman in Kamloops. Peter was born in 1914 and went to Stuart Wood School and excelled but eventually left school to work for his father who had started a grocery business, married Kim Kwong of Revelostoke in 1932 and became an active member of the Kamloops Board of Trade in 1934. Being civic-minded, Peter joined many organizations such as the Rotary Club f Kamloops which he joined in 1942, serving as president in 1976-77. As welll, he has been involved with the Chamber of Commerce and Union of BC Municipalities. In 1958 Peter ran for political office and was eleted the first public official of Chinese descent of any major city in North America. Following two more successful aldermanic elections, in 1965, he became mayr the 28th mayor of Kamloops. Peter won two more terms and retired in 1972. 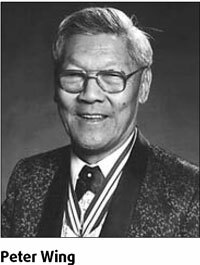 Peter Wing was a Canadian politician and was the first mayor of Chinese descent in North America. He was born in Kamloops, British Columbia in 1914 and had lived most of his life there. In 1934 he became a member of the Kamloops Board of Trade. First elected as an Alderman in 1960, he then served as mayor of Kamloops for three terms starting in 1966. During his term as mayor, Wing was also President of the Union of British Columbia Municipalities. Wing was also the first native-born mayor of Kamloops. In 1976, he was made a Member of the Order of Canada and was awarded the Order of British Columbia in 1990. In 1999, the city of Kamloops renamed the Peter Wing Rotary Rose Garden in his honour. On 27 December 2007, Wing died at the age of 93 in Vancouver from a stroke. 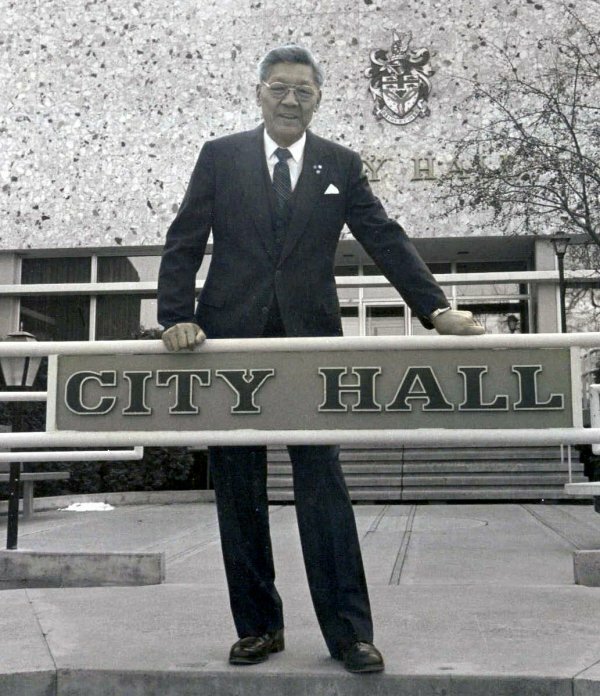 Updated: 2008-01-02 07:48 Peter Wing, the former Kamloops mayor who made history as the first mayor of Chinese descent in Canada and North America, has died at the age of 93. Wing died in Vancouver last Thursday after a stroke. Kim, his wife of 75 years, was with him at the time. Born in Kamloops in 1914, Wing lived in the city all his life and was also the city's first locally born mayor. He entered municipal politics as an alderman in 1960 and began the first of three terms as Kamloops mayor six years later. He also served as president of the Union of British Columbia Municipalities. It was people, not politics, that inspired Peter Wing to become North America's first mayor of Chinese descent, his brother was quoted as saying on Sunday in the Vancouver Sun. "He was interested in people and in helping people," David Wing, 71, said of his brother. "He went into these things with the mind to help people." Kamloops Councilor Patricia Wallace remembers Wing as a compassionate, thoughtful man who put people ahead of everything else. She believes this is why Wing is well remembered as a mayor. "People in the community had a tremendous amount of respect for him," Wallace said in the Vancouver Sun. "I never heard him say a bad word about anybody. "Born in Kamloops in 1914, Wing was one of six children of a landless Cantonese peasant. He dropped out of school in Grade 9 to work with his father, running a restaurant and then a grocery store. In many ways, Peter Wing led the way in exemplifying to Chinese-Canadians full participation in the public life of his community and Province. When Wing was 20, he became the youngest member of the Kamloops Board of Trade and pursued an active role in the business life of the community as an orchardist and realtor. He was made a member of the Order of Canada in 1976 and was a recipient of the Order of British Columbia in 1990. The City of Kamloops honored him in 1999 when it officially re-dedicated its rose garden as the Peter Wing Rotary Rose Garden. A memorial service will be held in Vancouver on January 11. David said Wing's ashes would be brought to Kamloops in the New Year. Overseas Chinese' role in North American politics has been more active over the past years. Elaine Lan Chao, 54, is now US secretary of labor in the Bush administration. Copyright © 2010-2013 Kamloops Chinese Cultural Association. All rights reserved.